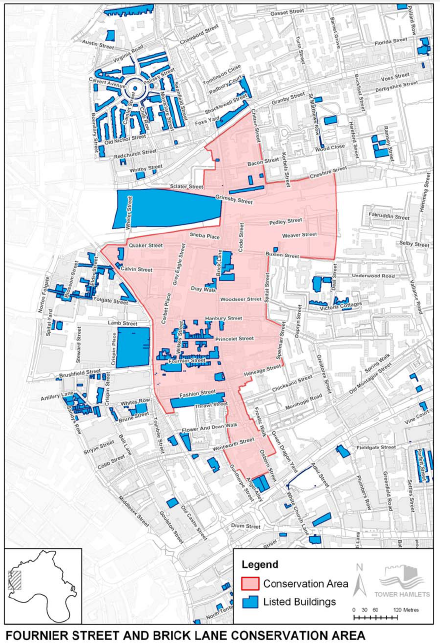 There are three Conservation Areas in the Spitalfields Neighbourhood Area: Fournier Street and Brick Lane, Elder Street, Artillery Passage. A summary and description of these Conservation Areas is outlined below. The Fournier Street and Brick Lane Conservation Area is one of the most important historic areas in London. It was designated in July 1969 as ‘Fournier Street’. It was extended in 1978 and again in 1998, when its name was changed to reflect Brick Lane’s contribution to the character of the area. It was further extended to the west and south west in October 2008 with the inclusion of St Matthews Church, St Anne’s Church and the Victoria and Albert Cottages. It is one of the largest in Tower Hamlets, running along Brick Lane from Bethnal Green Road in the north down to Whitechapel in the south. Most of this conservation area, but not all, is in the proposed Neighbourhood Area. It contains some of the most architecturally and historically significant buildings in the Borough, including the exceptional group of 18th century houses around Fournier Street. They comprise the most important early Georgian quarter in England. Fournier Street was originally named Church Street after the magnificent Christ Church Spitalfields; widely regarded as Nicholas Hawksmoor's greatest work, built between 1714 and 1729. By the 1960s the church was unused and almost derelict and came very close to demolition. However it was saved by the Friends of Christ Church who, since 1976, have raised over £10 million and gradually restored the church and its interiors. Within Christ Church is a unique pipe organ beloved of George Frederick Handel which was installed in the new church in 1735 and is considered to be the masterpiece of the greatest organ builder in Georgian England; Richard Bridge. This organ is currently being restored; work is expected to be completed during 2015. Between 1984 and 1986 the ancient crypts beneath the church were carefully emptied of their long-term residents by archaeologists for the Museum of London. The streets of Fournier Street, Wilkes Street, Princelet Street and Hanbury Street were laid out on a grid west of Brick Lane in the early 18th century. These streets are characterized by the exceptionally consistent quality of the original 18th century houses – the subtle variations of brick colouring, the original details of doors, windows, hoods and ironwork, and the standard of maintenance and repair. Individually, the houses contain features of high quality and historic interest, including paneling, mouldings and staircase balustrading, and as a group they form a valuable 18th century domestic townscape remarkably unchanged by modernisation or conversion. The Brick Lane Jamme Masjid (59 Brick Lane) occupies one of east London's oldest buildings which was first established in 1743 as a Protestant chapel ("La Neuve Eglise") by London's French Huguenot community. The building survived as a Huguenot chapel for more than six decades until 1809 when it became a Wesleyan chapel, bought by the "London Society for Promoting Christianity Amongst the Jews" (an organisation now known as the Church's Ministry Among Jewish People), but this phase of its history lasted only 10 years. From 1819, the building became a Methodist Chapel. In the late 19th century, the building was adopted by yet another community. It became the "Machzike Adass" or "Spitalfields Great Synagogue". During this time, the area was home to many Jewish refugees from Russia and Central Europe. The population of Jews gradually decreased over the years, with many moving to areas of North London. The synagogue, losing its worshipers, was eventually closed. La Neuve Église, since 1976 the Brick Lane Jamme Masjid, was constructed in 1743. During the 1970s, the area of Spitalfields and Brick Lane was populated mainly by Bangladeshis who had come to Britain from the Sylhet region looking for better work. Many found work in factories and the textile trade. That growing community required a place of worship, and the building at 59 Brick Lane was bought and refurbished. In 1976, it reopened as a mosque. No 125 with attached street name plaque to Sclater Street. The map of the Conservation Area below is before the 2008 extension. The Elder Street Conservation Area was designated in July 1969 and lies just outside London’s historic walls to the north-east. It is defined on its north-eastern side by the line of Commercial Street, to the west by Norton Folgate and to the south by Spital Square and Folgate Street. All of this conservation area is within the proposed Neighbourhood Area. Each of these streets creates a different character on each edge of the Conservation Area. Overall this is a cohesive area that has little capacity for change. Future needs should be met by the sensitive repair of the historic building stock. Originally an area of marshy ground outside the north-east corner of the ancient City of London, this Conservation Area contains the site of the Priory of St Mary Spital, which was established in this area in 1247. The ‘Hospital of the Blessed Virgin Mary without Bishopsgate’ provided care for the poor until it was closed by the dissolution of the monasteries in 1534-8, and ‘Spitalfields’ took its name from the fields next to the Hospital. Much of the area now within the Conservation Area had been the inner precinct of the Hospital Priory and after the dissolution and until 1900 it was the self-governing Liberty of Norton Folgate. In the 1920s and 30s, Spitalfields Market grew and consumed many of the historic houses on the eastern stretch of Spital Square. The houses on the north side of the western arm and the west side of the northern arm were demolished in the early 1930s to be replaced with a warehouse for the Cooperative Wholesale Society Fruit Warehouse. The demolition of many houses continued, until the 1970s when determined efforts by the Spitalfields Historic Buildings Trust succeeded in increasing awareness of the historic and architectural value of the surviving 18th century buildings and townscape. In recent years, a number of major office developments have been completed or are under construction, particularly just outside the Conservation Area to the south and west. The area retains its quiet, residential character, although there are many offices interspersed between the houses and flats. Small-scale services such as shops, restaurants and pubs also occupy the ground floors of some buildings. During the working week, there is a measure of commercial bustle, while at weekends the area is mostly quiet except for movement around Spitalfields Market, which is outside the Conservation Area. on the qualities that led to its designation. The Artillery Passage Conservation Area was designated in September 1973 and was extended to its present boundaries in 1975. It is defined by Brushfield Street to the north, Fort Street and Sandy’s Lane to the west, Frying Pan Alley and Brune Street to the south, and Toynbee Street to the east. All of this conservation area is within the proposed Neighbourhood Area. Artillery Passage is a surviving fragment of the 17th century street pattern, characterized by its network of historic narrow passages, lanes and courtyards. There are often several land uses within each building, including a significant number of residential dwellings, and this fine-grain mix of domestic-scale units is an essential characteristic of the area. The buildings are mainly narrow-fronted Georgian 2, 3 and 4 storey houses with mansard roofs and retail uses on the ground floor. They are not set back from the street or lane, and form continuous building lines and a clearly-defined enclosure to the street. The mainly 19th century shopfronts in Artillery Lane and Artillery Passage make an important contribution to the character of the area, and the Grade I listed 56 Artillery Lane is particularly valuable as one of the most significant surviving Georgian shopfronts in London. Nos 56 and 58 also have remarkable panelled interiors and hall mouldings. Sandy's Row Synagogue, in the heart of the old Jewish Quarter, was established in 1850. Many properties still retain their original panelled front doors, as well as associated letter boxes, door knockers and other features of interest. Ironwork forms an integral part of the Georgian and Victorian architecture in the area although much was lost in the war. This takes the form of railings, gates, decorative balconies, coal holes and bollards. Most windows in the area are double-hung sash windows with fine glazing bars. Shops normally have exterior hanging signs, and fascias are externally lit. Sandy's Row Synagogue (pictured) was established in 1850 in a building which had originally been a Huguenot chapel named L'Église de l'Artillerie that had been constructed in 1766. One Gun Street is converted into residential apartments. The main bulk of the building has been demolished but the façade still remains facing Gun Street. The Convent of Mercy, which backs onto One Gun Street, was also converted as part of the same scheme, but retains most of its original form including its Chapel. The area between Brune Street and Whites’ Row also comprises three and four story Georgian houses and a few modern or rebuilt office blocks. The former Soup Kitchen for the Jewish Poor on Brune Street is a distinctive brick building with a terracotta frontage at ground floor level. Along Tenter Ground the style of the old warehouse buildings is reflected in the style of the new development opposite and similar efforts have been made in other areas of the Conservation Area. Rooflines within the Artillery Passage Conservation Area tell the story of the area’s piecemeal development, and they vary according to each building’s individual age, type, width and height. Bishops Court is a large office development between Artillery Lane and Brushfield Street. Its white metal cladding is out of character with the area, as are recent parts of Frying Pan Alley. Today, despite the changes to its surroundings, the narrow lanes and passages of this small Conservation Area represent an irreplaceable window into the past – a rare surviving fragment of an ordinary mixed-use residential district of the 17th, 18th and 19th century inner city. This is an area of particular special architectural and historic interest, illustrated by its rich history and significant architecture, dating from the 13th to the 19th centuries. The character and appearance of the area, as described in this appraisal, define its special qualities. There are a few gap sites and some minor inappropriate buildings in the Conservation Area, but overall these have little impact on the qualities that led to its designation. The Wentworth Street Conservation Area was designated in October 1989. It is defined on the west side by Middlesex Street, formerly known as Petticoat Lane and the site of the medieval market. The area’s character as a mixed use residential and commercial area, and its association with the clothing industry, has endured for hundreds of years. The area extends east along Wentworth Street, and north and south along Leyden Street, Bell Lane and Toynbee Street. Its eastern boundary extends across Commercial Road to include a small group of listed buildings. The area can be broadly divided into two character areas – the area west of Toynbee Street, and the area to the east around Commercial Street. Most of this conservation area is within the proposed Neighbourhood Area. On Wentworth Street and the surrounding streets in the western part of the Conservation Area, the famous Petticoat Lane market still operates market trading every day. The market’s presence contributes to the liveliness and activity on the streets and the enduring heritage of the clothing industry in this area. The mix of other small scale businesses in the area contributes to the activity on the street. There is a regular grid structure of streets which has its origins in several medieval lanes and passages, meaning that the block sizes are unusually small. This gives the area a permeable quality (of both movement and views) which is an important characteristic for the market which extends over several streets. Most of the buildings in this area are 19th century mixed use buildings of 2-3 storeys. There are generally no setbacks to the buildings, which have a fine grain of narrow fronts. The buildings on the western edge along Wentworth Street are larger and taller, often rising to 4 storeys. Wentworth Street Conservation Area Page 7 of 17 rusticated pilasters and a pediment on the corner. Then there is a grander commercial block at No. 82 which dates from the 1920s. In summary, the character of the buildings varies greatly throughout the Conservation Area, but most contribute to the general low-rise, mixed use, fine grain character. Several of the buildings built on Commercial Street are architecturally and historically significant, and were built to a larger size to reflect the scale and importance of the new road. No. 43a Commercial Street was built in 1841 as the Jewish Infant School, but has since been converted to other uses. It is a distinctive 2-storey building of yellow brick with stucco quoins and decorative mouldings, and is important for its historic value as well as its contribution to the townscape. Internally, its fine metal railed stone staircases are also significant. There are many mid to late Victorian commercial buildings of 4-5 storeys along the road, containing shops and warehouses with a variety of well-detailed elements and polychromatic brickwork. Nos 44-54 Commercial Street were built around 1868 and are significant as little-altered examples of mid-Victorian commercial premises. Brody House is a robust 1930s building which has recently been refurbished.